In one of Barnard College’s favorite traditions, this year’s Convocation ceremony took place on September 13, 2018, in the majestic and historic Riverside Church. Hundreds of students, trustees, faculty, staff, distinguished guests, and alumnae going back to the Class of 1947 participated in this college-wide celebration. Ninety-six alumnae marched in the ceremonial procession dressed in academic regalia and carrying class flags, cheered on by new and returning students. 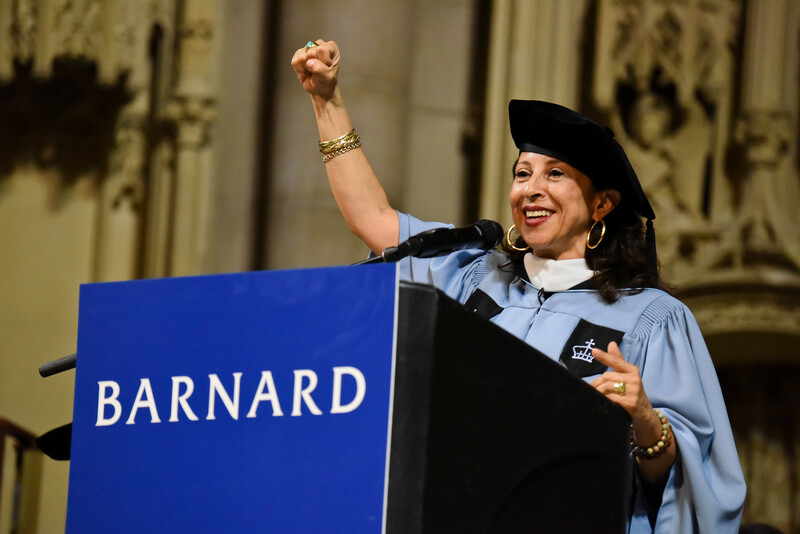 Keynote speaker Maria Hinojosa ’84, the award-winning news anchor and reporter; executive producer of Latino USA; and president and CEO of Futuro Media Group, told the students that the power of their voices is more urgent than ever before. "We don't have time to wait" when it comes to speaking up at this moment when American democracy is at risk. Barnard women are the faces of a new women's movement who must counter the prevailing "narrative of fear" that frames people of color, and especially women of color, together with all women, as objects of fear. "As a woman at Barnard, you are coming into your own power," she said, and offered examples of how she uses her own power. "In my newsroom, you will never hear the word 'illegal' to describe a human being. ... You also will not hear the word 'minority.' ... I am changing the narrative." Hinojosa noted that Barnard students also have the power, the privilege, and the responsibility to change the narrative. "We must use this privilege, and we need you to own your power and voices--now, more than ever." Nicola Kirkpatrick ’19, Student Government Association president, announced that the SGA is pledging that all students—including those who are first-generation, low-income, transfer, international, and commuter students—are effectively represented. "Some may think life begins the moment you graduate," she said, "but I think you'll find that the accomplishments and successes of your fellow students prove that, for many, life begins here at Barnard." Students from first-years to seniors took part in Convocation, wearing special t-shirts for the occasion. Tiange Zhao '22 marveled over the beauty of Riverside Church. "I'm excited about the energy," said Mariel Correa-Maynard '22, while classmate Maria Ponchkos '22 looked forward "to seeing different generations of alumnae" and Sarah Beck '22 observed that "Convocation enhances the sense of community." In 2014, when Barnard celebrated its 125th anniversary, the College began the tradition of inviting not only first-year students but the entire Barnard community to kick off the academic year. Among the participating alumnae was Kathy-Ann Irish-Benjamin '82, who traveled to Barnard from New Hartford, New York, to represent her class. "I've wanted to come to Convocation for years," she said, "and this was the first time I could make it. I'm so happy to be here and to be part of this tradition." Convocation marked the beginning of a new academic year and the power of community. Check back for more photographs and video.